Ok. I am new to this blog thing, so we will see how well I keep up with it! We are enjoying our fist Christmas in our new house! Gary decided he really wanted a live tree this year. So we went to a Christmas tree farm in East Texas. They take you on a hay ride to pick your tree and they give you a saw to cut it down yourself! Gary and I really enjoyed picking out our tree. Of course, we had to put lights up on our house this year. Gary especially loves to look at Christmas lights. We have been to several neighborhoods all ready! We found a new neighborhood in Plano that we love. 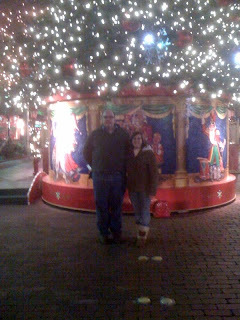 We also went downtown to look at the Christmas Tree Downtown. We like to drive by a house on 7th street that has amazing lights each year. Not sure who lives there, but based on the house, they are important! 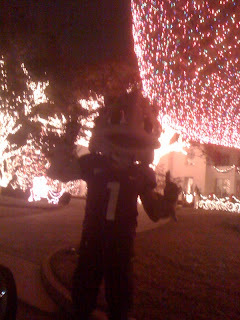 Every year they have a few TCU decorations. I figured that they would have a ton this year. So we drove by the house about a week ago. They had a live Santa, Rudolph, and Frosty there greeting the people who drove by. And Super Frog. Yes, the TCU Super Frog. I couldn't believe it. It was so funny! 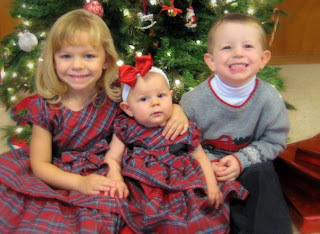 I also have to share a picture of my adorable nieces and nephew. I can't wait to watch them open their Christmas presents and spend Christmas with them! Jamie, Camron, Lucas, Gracen, Gary, and I went to a house in Grand Prairie where a man sets up a snow village in his garage. It has trains, McDonalds, schools, churches, Starbucks - anything you can imagine. Lucas especially seemed to love it. Then we went and drove through the Grand Prairie Lights-a drive through Holiday light park decorated with tons of lights. They also have a walk through forest with tons of lighted decorations. We had so much fun! Also, one of our favorite things to do during the Holidays is to go to Bethlehem Revisited in Waxahachie. They recreate the town of Bethlehem. We followed Mary and Joseph as they walked through Bethlehem. The Shepherds and Wisemen came to visit baby Jesus. There were real camels. They have different Bethlehem shops where they make flutes, clothes, bread, etc. and give you a little lesson on how they make it. It is really neat! We also toured some beautiful, older Waxahaxie homes that are on the Candelight Tour decorated for Christmas. As you can tell we love the Holidays! I am enjoying being out of school! I love Christmas Break! Glad you decided to join the blogging world! Hope you have a great break from school! Yay! I look forward to reading more posts. My family and I used to go to a Christmas tree farm and cut our own tree down, also. It was soooo much fun!